Do not forget to contact me to book your place at the Co-operative’s FRACK FREE FUTURE camapign launch at Bridgend college – see down a few posts. “Please join us in a peaceful protest against the threat of fracking in the Vale. Although this application is just to test drill, we are fearful that if it is allowed and they do find gas, we will be facing a much bigger fight! The councillors should not even entertain this idea in the Vale of Glamorgan and it needs to be stopped now. 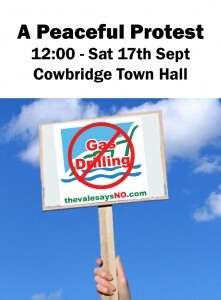 We all need to show the councillors just how much we object and we can do this on 17th September at Cowbridge Town Hall. Cabinet members and senior council officers will be holding a surgery for the public to raise their issues, so lets create a presence and raise our issue about the Vale fracking threat! We hope to attract media attention to this protest, so tell you friends. Lets get as many people there as we can! This entry was posted in Uncategorized on September 14, 2011 by Bridgend's Green Leftie.